The digital media has made communication between state and citizens very easy, removing all limitations and barriers between the government, service providers, and citizens. This new age media's omnipresence gets diverse attention generating multiple responses. Each era appears to have its own set of ritualized phrases that enable diplomatic agents to communicate even unpleasant things with an amount of tact and courtesy. This chapter explores e-diplomacy. The principle of non-redundancy means “a diplomatic communication should say neither too much nor too little because every word, nuance of omission will be meticulously studied for any shade of meaning” (Spencer, 2005). Earlier, common people had to go through a long process to send their requests and share their problems with the government. Therefore, the response from government also used to be late, triggering anger and dissatisfaction among people. The situation has changed now with social media tools like Facebook and twitter bringing in a paradigm shift in the communication process. Timely communication with the people captured in a conflict or difficult situation and constant counselling of their relatives and family members at home is very important at the time of crisis. Specifically, in a situation when government is at the end of providing all required information and support. The e-diplomacy has thus given a new dimension to handle crisis. 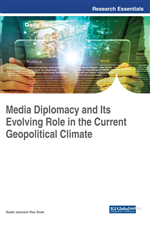 This chapter evaluates India’s thrust on using this new age media in its diplomacy at the time of international crisis drawing positive as well as negative impacts. Timely help during any crisis can be counted among the biggest benefits of social media. Things go fast viral on social media prompting the government to take action quickly. “Today 72 percent of global migrants are of working age, reflecting the economic motives of their displacement. Their rising assets and wealth makes these migrants vital to their home economies, whether in terms of deposits, trade, or the transfer of skills and know how” (Xavier, 2016). The percentage of Indian moving to foreign countries has increased in last few years, we can see the impact of Indians contribution not only in job sector where they are using their expertise and knowledge but also in other areas such as politics and cultural togetherness, Indian contributions has been recognized all over. Therefore, “beyond such periodic measures to secure their diaspora as a prized asset, home states are also more inclined to protect migrants in extraordinary times of crisis. As a vulnerable and dislocated population, migrants are particularly exposed to various risks abroad, including natural disasters, political unrest, and violent conflict in their host country or region” (Xavier, 2016). Social media is a new and highly effective mode of interaction and influence, which the present government acknowledges. It requires constant engagement and adequate resources to be effective and needs to go beyond being a one-way street. Citizens would recognize good and inclusive governance only when their insights are invited, responded to, and included in policy promptly and effectively (Arora, 2016). Communication patterns are therefore more integrated as they are focused on multi-actor networks rather than separated state and non-state diplomatic structures. This is reflected in the preoccupation with defining and operationalizing public diplomacy strategies that have tended to be seen as separate from rather than integrated into broad diplomatic strategies (Hocking, Melissen, Riordan, & Sharp, 2012). Far from being rendered irrelevant by technological progress, where governments can communicate with one another directly on a need-to basis, diplomacy has become an increasingly critical instrument in an age of interdependence and globalization. Responding to the ever-changing world around it, diplomacy has evolved and adopted new tools and techniques to respond to the new demands and expectations (Thakur, 2012). “The levels at which diplomatic discourse takes place, and does so simultaneously, range from the local to the national, bilateral, regional and global” (Thakur, 2012). “Network diplomacy” is based on a much larger number of players (particularly of civil society), a flatter structure, a more significant oral component, and greater transparency. One of the most powerful tools of networked diplomacy in turn is the existence of strong, vibrant and successful diaspora communities spread across the influential countries of the world today (Thakur, 2012).